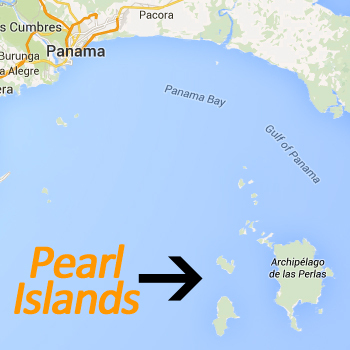 The Pearl Islands are located on the coordinates 8.3333° N, 79.1167° W not far from the equator. Therefore, the climate on the Pearl Islands is different than in the US. There are only two seasons a dry and wet season. This doesn’t always apply since some years receive rain all year around and sometimes the islands experience a dry year. One benefit of the location close to the equator is the stable temperature all year around. As we mentioned above the Pearl Islands of Panama only experience two types of seasons. There is a wet season which experiences much more rain and clouds than the dry season that has higher temperatures and clear skies. The dry seasons is probably the best time to visit the Pearl Islands since the weather is nice and you probably won’t experience much rain. The dry season starts in December and end in April. The average temperature in these months is around 31°C degrees Celsius and rainfall is around 3 mm averages each month. Expect around 5/6 hours of sunshine every day. You will be able to enjoy the islands in 11.7 hours of daylight 11.7. The wet season kicks in around June to November with its peak in October. This is probably the best season to spot humpback whales by the way. The average month will receive around 20-25 mm of rain, which is more than the dry season but still not that much. The average temperature in these months is almost the same as in the dry season around 30°C degrees Celsius with at least 5 hours of sunshine. You can enjoy the islands in at least 12 hours of daylight. The only real difference with the dry season is that there are more clouds around this time of the year. One of the great differences of the Pacific Ocean is that the water temperature is slightly lower than for example on the same longitudes in the Caribbean Sea. The average water temperature is between 24°-29°C and can be even colder when Nordic winds blow the sea currents along the Bay of Panama.